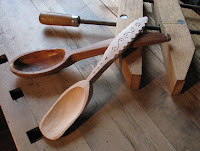 My first attempt at spoon carving resulted in a piece of dinnerware befitting of Fred Flinstone. Chunky, lumpy, and dino-sized. In my defense, I didn't have any green lumber so I grabbed—what else?—a gnarly piece of cherry whose grain pattern looked like a Jackson Pollack painting. Plus it had a few knots. Nonetheless, I bullheadedly worked on this ornery piece of wood until I sprouted a few blisters on my hand. During this time, a chunk of dry silver maple soaked in a tub in an attempt to soften the fibers and make it easier to carve. The second sp oon went more smoothly and the straight grained, semi-softened maple was much easier to carve. 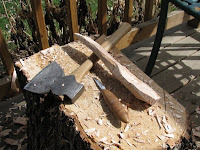 I rough shaped both blanks with my new BTF (Best Tool Forever)—a hewing axe—and a slojd knife at my outdoor bench. The cherry was too hard to cut with hook knives, so I secured the blank in a simple jig: a long v-block with two stops at either end of the workpiece. Then I hollowed out the bowl with spoon gouges. The hook knives worked great for final clean up. 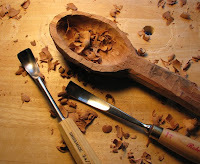 The decorative elements on the maple spoon were carved with a gouge, chip carving knife, and stab knife. And after finishing the second one, I hope I've moved up to the middle ages.